Some of the opponents in the southern provinces of the country believe that political intolerance has intensified in these provinces. Victims denounce several arrests and ban on meetings. They ask the international community to follow the situation closely. According to the information collected on the spot by Iwacu correspondent, the leaders of the CNL, Frodebu, CNDD and RANAC political parties in the southern region of the country are protesting over the political intolerance observed in Rumonge, Makamba and Bururi provinces. The CNL party reports that young members of this party have been abused by young members of the CNDD-FDD ruling party in Minago zone of Makamba province on 31 March. “They have already filed a complaint to the police in Rumonge”, said a leader of the party. In less than two weeks, three people were arrested in Burambi and Rumonge communes of that province. Sahwanya FRODEBU party denounces disputes when it set up committees at the localities of Kayogoro, Mabanda and Nyanza-Lac communes in Makamba province. “Administrative officials and youth members of CNDD-FDD ruling party-Imbonerakure have thrown a spanner in the works”, said a local official of the party. Two weeks ago, it was banned from holding meeting. “Makamba Governor has finally intervened”, in Gatwe locality, Kizuka area. Sahwanya Frodebu party says that their flag was torn off in Kiremba commune. In the run-up to the 2020 elections, these opposition party leaders are calling on the international community to closely monitor the situation, especially the shrinking of the political space. On 14 February, six members of CNL party are arrested in Muyange locality, Mugina commune, of Cibitoke province by youth members of CNDD-FDD party. They are accused of organizing illegal meetings in the night. They will eventually be released for lack of evidence. On 17 February, a day after the approval of CNL party in Bweru commune of Muyinga Province. Léonidas Congera is beaten to death in the night. MP Pascal Bizumuremyi denounced a group of young people, members of the youth wing of CNDD-FDD party led by Dieudonné Ncamwaka, also known as “Major”. The victim is hospitalized. A CNL member calls for the arrest of the perpetrators. On 17 March, two young people abducted Eric Niragira from Murwi commune to an unknown destination. Three days after a family complaint, the Prosecutor in Cibitoke province delivered arrest warrants for two Imbonerakure youths involved in Niragira’s “kidnapping”. The family recognized the kidnappers. A certain Schadrack Niyonkuru and Jean Marie also known as “Kajagari”, all Imbonerakure living in Buhinyuza area in Rugombo commune, on 7th side road. The family searched in several dungeons after these two Imbonerakure took him in vain. His family members found him three days later in custody of intelligence services in Cibitoke province. The prosecutor will later say that “Eric Niragira was not kidnapped”, without further comment. About ten Imbonerakure youths, led by “Kidaga”, deputy locality chief broke into the Pacifique Nduwarugira house on the same day around 4 pm with clubs. They will picked him up with his father Bizimana and Japhet Irankunda after beating everyone. The victim’s wife said: “these Imbonerakure did not ask for anything. They beat everyone, starting with my husband. Even my mother-in-law and my father-in-law, all in their sixties, were not excluded”. They grabbed three phones. According to Ms. Ntunzwenimana, they also took BIF 30 thousand. On 19 March, three members of Sahwanya Frodebu party were arrested in Makamba province. They are accused of beating young members of CNDD-FDD ruling party. Representatives of Sahwanya Frodebu party reject the accusations and ask for an immediate release of their members. On 21 March, five members of CNL party were arrested on Gatare locality of Gashikanwa commune in Ngozi province. On 26 March, Philibert Batururimi was arrested on Ryarunyinya locality in Ruhororo commune of Ngozi province, in the north of the country. On 25 March, Dieudonné Niyongabo was arrested by Imbonerakure youth in Gitanga area in Karusi province and imprisoned in Buhiga commune custody before being released, a day after. The situation is similar in Cibitoke province, in the western region of the country. In addition to four members of CNL arrested on 17 March and detained in Murwi, Georges Itangishaka, Daniel Nizigiyimana and Raymond Nkurikiyimana, all CNL officials in Mugina commune, were arrested on 25 March in Gitumba area. They were accused of organizing an illegal meeting. 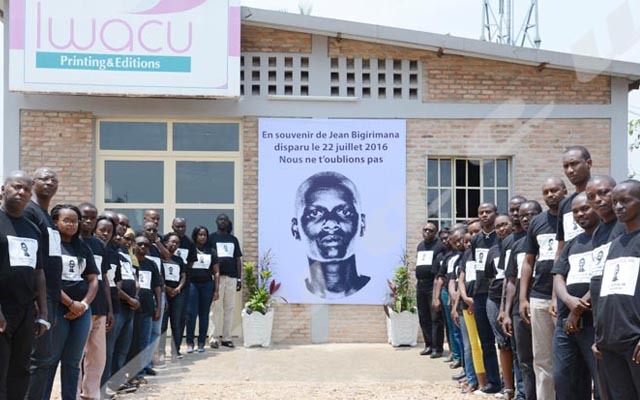 In the North-East of Burundi, in Butihinda commune of Muyinga province, Edmond Ntakirutimana and Alexandre Nshimirimana, two communal officials of CNL party spent 5 days in the communal cell since 19 March. In Busoni commune of Kirundo province, Aimable Ndayizeye, a CNL member from Sigu area was killed in the night of 24 March. On 24 March, nine members of CNL party were also arrested by the police in Gitega and Itaba communes of Gitega province. They were also accused of organizing an illegal meeting. During the same day, Aimable Ndayizeye was stabbed to death. This happened in Sigu area, Nyagisozi area of ​​Busoni commune in Kirundo province. That same evening, , Sabintore, another CNL member was wounded in a grenade attack in Cewe locality in Kirundo province. Oscar Nizigiyimana, chairman of CNL party in Kirundo province said that Aimable Ndayizeye chaired the youth committee of Nyagisozi zone and Sabintore was part of the committee in Cewe locality. He denounced political motives behind these attacks. Alain Tribert Mutabazi, Kirundo governor dismissed all allegations. The victims were not members of CNL party, he said. “Aimable Ndayizeye succumbed in a fight that went wrong. The suspected perpetrator was arrested. The one who was wounded is a simple citizen, he said. On 1 April, nine members of CNL party in Mugina commune of Cibitoke province were released on the order of the Attorney General of that province. He had found that there were not enough tangible accusations against them. Good news for Simon Bizimungu, CNL deputy elected in Cibitoke constituency. He deplores an abusive arrest by the Imbonerakure youths. Abel Gashatsi, chairman of UPRONA acknowledges a lot of cases of political intolerance where some politicians do not accept democracy and plurality of parties. “They must know it. It’s like religion, everyone goes to pray wherever they want, and no one can force anyone to join a church. For the chairman of UPRONA, leaders of political parties must calm their members and call them to be quiet, especially since people are becoming excited as we are approaching the 2020 elections. For the chairman of CNL party, this is unacceptable intolerance. “Why are we being abused as if we are not citizens like others?” Agathon Rwasa believes that this is a tactic adopted by the ruling party to monopolize the population and prevent others from exercising their political right. “Everyone has the right to join a party they want.” This tarnishes the image of the government both nationally and internationally. The contribution of every citizen is needed to develop Burundi. “But we cannot participate in the country’s development when we are mistreated and persecuted”. The spokesman for the Ministry of the Interior denies accusations made by political leaders about the recurrence of political intolerance. He indicates, however, that the Minister of the Interior sent on March 23 a letter to the leaders of the political parties asking them to update their representation in all communes and provinces. In the case of CNL, Thérence Niyongabo says that this party has not yet submitted to the governors of 12 provinces the papers indicating its current leaders and that it wishes to carry out its activities in those provinces. “If they are caught holding illegal meetings, it is normal for them to be arrested. We must comply with the law. Nancy Ninette Mutoni congratulates the ruling party youths ‘Imbonerakure’ for staying calm over provocation. Nancy Ninette Mutoni prefers to “congratulate the Imbonerakure for their calm over provocation”. Analysis/ Instruction or excessive zeal? People give a lot of testimonies. Anger is palpable. Across the country, several people say they were arrested and late released, for lack of evidence. Some families are still waiting for theirs, detained in various prisons to be released. Each time, the accusation made is “arrest for investigation reasons”. It is unstoppable. The accusation allows you to detain and release a person a few days later, simply saying that “the investigations have not revealed anything; you are free, go home.” Only in the meantime, the person was deprived from their freedom while their families lived in anguish. It is a violation of citizens’ rights. “It’s generalized; they are longer isolated cases. It’s hard to imagine that these Imbonerakure are acting on their own accounts, “says Simon Bizimungu, a member of parliament elected in Cibitoke constituency. If it is an excessive zeal of certain ruling party members, the power should act and severely punish those who considered themselves as judges, jury and executioners. The authorities are therefore called upon to act in order to avoid a confrontation. With the growing tension, a small drop of liquid could break the vase. The ardor of one and the other must be avoided. The power plays its image. Those who are illegally imprisoned, beaten, tortured may increase the number of refugees. This could also break the will of some refugees who hope to return home. Security and peace deserve to be fought for. According to our investigations, one year before the 2020 elections, tension is increasing. If the troublemakers are not punished, it is appropriate to imagine that in 2020 the tension will heighten. A question also arises as to when the victims of abuse will continue to keep quiet. Who wants peace, prepares peace, they say.